This privacy notice discloses the privacy practices for www.VacationInParis.com. This privacy notice applies solely to information collected by this web site and through telephone contact. Vacation In Paris LLC is the sole owners of the information collected on this site. We only have access to/collect information that you voluntarily give us via email or other direct contact from you. We will not sell or rent this information to anyone. We will use your information to respond to you, regarding the reason you contacted us. We will not share your information with any third party outside of our organization, other than as necessary to fulfill your request, such as to ship accommodation keys and/or information. We may also request that you share your vacation experiences with other vacation travelers. We take precautions to protect your information. When you submit sensitive information via the website, your information is protected both online and offline. For all reservations in which the client elects to pay by credit card, the credit card information is NOT collected by our company- a secure third party payment service is used for this purpose (PayPal). We will promptly remove your address from our distribution list. Paris Street Signs: You'll typically see a street sign on every corner and most often attached to the side of a building. The sign gives the name of the street as well as the arrondissement (district). 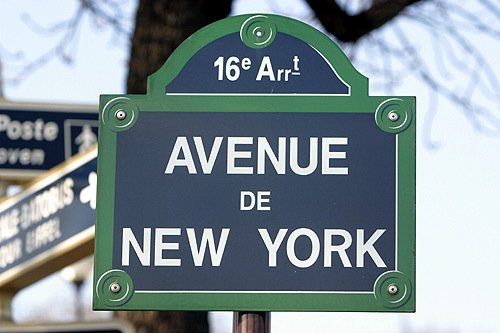 Avenue de New York is in the 16th arrondissement.